When it comes to classic interior beauty, few elements can compare to hardwood flooring. Wood floors offer a durable surface that can pair with nearly any decorating scheme. Wood species come in a plethora of colors and patterns, giving homeowners dozens of options to choose from. And, when looking to sell your home, hardwood flooring is highly a sought-after feature in many markets. With regular maintenance, wood can last hundreds of years without decay or wear. However, without the proper care, hardwood flooring will show signs of age much sooner. Stains, fading, warping, and scratches can all damage the appearance and integrity of hardwood. Protect your investment and the beauty of your home. If you're lucky enough to have hardwood floors, be sure to use the following five steps to protect them from everyday wear and tear. Be smart about where you place rugs and carpet runners. It's a good idea to use rugs in high-traffic areas, like hallways, entryways, and under well-loved furniture. Ideally, the edge of a rug should also be about 12 to 14 inches from the room's perimeter. You can even place a rug under the dining table to protect your floor from spills and chair scrapes. Wood is an organic building material that responds to atmospheric humidity. 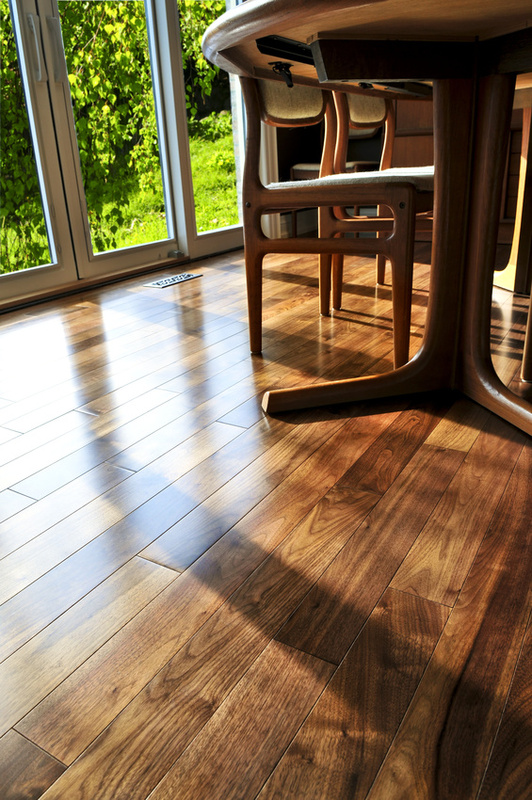 Like your doors or windows, wood floors may expand in humid environments. Frequent fluctuations in the air's moisture can cause the floors to expand and contract accordingly. Over time, these humidity changes will warp the shape of the floor, possibly even cracking the wood's surface. For optimum indoor air quality, humidity should be kept between 30% and 55%, though some recommend keeping levels between 40% to 60% for the best wood protection. One of the easiest ways to protect wood flooring is to keep it clean. Prevent the buildup of dust and debris by sweeping and vacuuming regularly. After sweeping, mop with a moist microfiber pad, but don't let too much water pool on the floor during cleaning. Puddles of any liquid will warp the boards and leave unsightly stains. 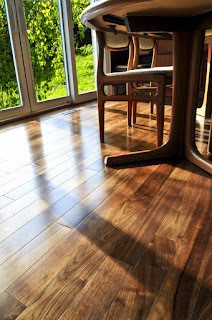 Believe it or not, too much sunlight can also damage hardwood floors. Sunlight from windows will fade the color of the wood over time. To prevent sun damage, be sure to cover windows with curtains, blinds, or other window treatments. Rearranging furniture and moving rugs can also keep one part of the floor from fading faster than other areas. Though refinishing wood floors can be a chore, this process is essential to preserving the floor's beauty over a long period of time. Every two or three years, give the floors a light sanding. Then, refinish the floor with a coat of polyurethane. Wood floors are stunning in any home. However, failing to care for wood flooring can cause it to age and wear prematurely, robbing it of its beauty. Don't let your home's appeal fade, and protect your wood floors. With this guide, your home's unique natural floor will continue to impress for decades to come.